Here you will find the solution to all the battles of the new installment of Dragon Ball. With the video guide, you have the opportunity to see each Saga Story mode and the 10 fighting to learn the best strategies. Usually, each mission displayed in a video, with the locations to visit and battle. CIRCLE BUTTON: throw a fireball. L1 BUTTON: block one attack. L2 BUTTON: rise into the air. / BUTTON L2 + O: lateral evasion. R2 Button: display menu combat skills. BUTTON L3: down a bit. CROSS LEFT: using Tracker (not available in combat, only in side quests). CRUCETA UP: display information about the mission. TRIANGLE BUTTON: attack to break the enemy's defense. SQUARE BUTTON: strengthening basic attack. L2 BUTTON: quick flight (powered with + left stick). R1 BUTTON: keep the enemy fixed. BUTTON L3: go down gradually. Visit constantly Tokitoki City, because it is the true progress of the game. Shop for items you must constantly haunt to make with jars of PS and ki, both for yourself and for your allies in combat. Check out the "Tokitoki City" section to see what you can find here, both in terms of shops as game modes. For those inexperienced in the series, you must know that attacking like crazy and take this game as a simple arcade fighting is useless. Although, learn it might be a bit rough from the start; OMG as dominating the combat system, deeper and you will find best attacks to go using. Choose your class based on predefined baseline characteristics. While all races have, more or less, the same line of evolution throughout the adventure, you'll be in some certain powers aspects such as physical strength and health. But equally, you must go balancing your character in the skills menu and go completing secondary tasks. Take the prologue and the first saga to familiarize yourself with the skills of your character. You will be very easy to overcome the first missions, so you should go using these battles as training for future skirmishes: Know that from the Saiyan Saga difficulty peak will occur. Here we show you five different classes you can choose to customize your character. Strike Force: high (very high if it is male). Speed: low (high if female). Health default: medium (high if it is male). Speed: high (+ bonus when PS is low). Effectiveness of items: high. Very high at level 20. Strike Force: medium (high if it is male). Resistance: Medium (low if female). * The female has a bonus ki. 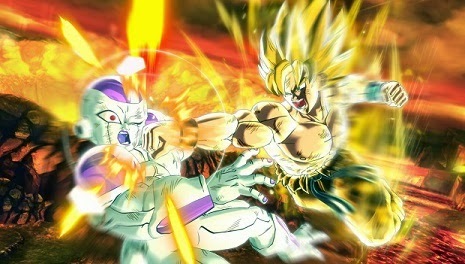 Frieza is in its weakest form and also are in the prologue, so he will not use his fearsome final attacks. Stick to hit as the basic controls on the remote. You should finish him without much difficulty. We recommend that you take this fight to train flight, avoidance techniques BUTTON L2 + O button and impulses with L2 + JOYSTICK BUTTON LEFT. Practice kicking in flight (plan with BUTTON L2 and press TRIANGLE BUTTON once to deliver an strong kick the enemy) and ends with him when you're ready. It is the form of Buu that will give you less problems. If you practiced the techniques of evasion and flight of the second confrontation, you can end up with Kid Buu to go directly to the first series, delve into the hand controls Trunks and begin the adventure. And before starting the next section of the series, you will have to necessarily in order of Trunks play, a tutorial for you to know the dynamics of the side missions. Begin combat planning and depart from his point of view. Trunks attacks fail to throw a blast. Any improvement that you buy in the store of skill Tokitoki City welcome. The Kamehameha is especially effective when Miira is restored at once and plan to gain an advantageous position. As is restored, fixed Miira and loads the Kamehameha to give full and enhance its effect. In the requirements of defeat, says "losing PS Player", which means that no matter if Trunks is KO during the battle; yes, your help will be indispensable for attaining a good score. Make sure you have retained some medicinal bottle: the melee attacks Miira are lethal. Become a tactic of avoidance or teleportation TokiTokiCity. Tea zafarte of his punches and keep you "hook". Do not miss, Son Gohan! Perfect Cell. Use gusts to break their defense and stun. Take time to strike a blow as melee combo. Avoid the combined attacks BUTTON R2: not prove to be as useful as they should. The best strategy is to strike a combo with TRIANGLE SQUARE BUTTON or BUTTON. The Kamehameha is good ... if Son Gohan stunning them first. For some reason that escapes our reason the Son Kamehameha Gohan is tremendously effective and yours stays in a scratch. Make combos in installments, ie a strong attack combo x6 him is when you need to escape its scope and plan to circle. Avoid the rush and return to the fray avoid falling into the first hurdle. Let Son Gohan take the lead in this fight: your role should be limited to intervene when cell is stunned aftermath of the attacks of your ally. Frieza Emperor!, At last! Super Saiyan angry, Final Match! All my power, Combat Mr. Satan! Out of my way, Mr. Satan Immortal Cell Games, Son Gohan furious! Danger: Cell Jr., Miira, the warrior of the future! Cell are here? Save Trunks! The cell patterns struggle have not changed, so we refer the showdown against Perfect Cell Saga Cell so you take a look at the tips of combat, because here you will be equally useful.